As a high school senior the prospect of a $5.15 minimum wage was not very enticing. However, with graduation on the horizon I began to realize that my allowance just wasn’t going to cut it. So one night, when my friend and I were eating McDonalds dollar fries and sharing a soda, I picked up a triangular pamphlet from the middle of the table. It promised an exciting career in a fast-paced environment and was plastered with images of a smiling multi-cultural workforce. A few days later I was at a new hire training session inside a beige faux stucco strip mall. Neither my friend nor I had been required to interview for the positions, which meant we only went down to watch boring customer service videos and pick up our uniforms. The maroon golf shirts with a golden arch logo were accompanied by black pleated pants. Not only did I hate the color combination, but the shirt was four sizes too large and the pants simultaneously too short and too wide. The pleats made my thighs look like inflated balloons; not that my mother seemed to notice. It’s the kind of encouragement you need for your first day on the job, but it made me feel worse- I didn’t want to be an excellent patty flipper. As it turns out my fears were unfounded because I was never promoted to working on the grill. Every weekend I divided my time between the front counter and the drive-thru where my milkshakes overflowed, the automatic window trapped my head, and my baker’s dozen always had twelve cookies. Although I made a few mistakes and flooded the kitchen, I still received my big $.10 raise after a month of excellent customer service. After living in Sydney though, I realized that fast food workers in the US really have the short end of the stick. Aside from higher wages in Australia (well, it’s on a tier system for workers under 18- but even the lowest rank still earns more than many US states), the fast food choices are better. 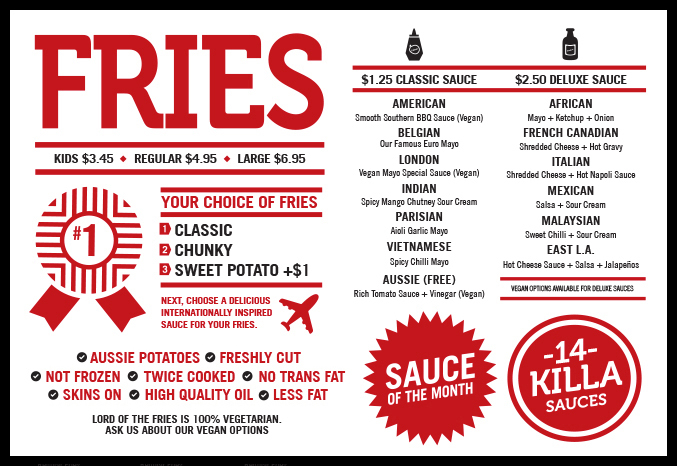 For example, the Melbourne chain Lord of the Fries just opened up in downtown Sydney. I don’t know if you noticed, but they have 14 killa sauces and an option for every dietary restriction. It’s the kind of place where people line up for a greasy late night snack after a night of drinking and the kicker is that all the burgers are vegan or vegetarian. They even have gluten free buns! Why wasn’t this place around when I was 17 ? Years from now if any of your children wanted to work at McDonald’s, what would be your response? Is this a terrible rite of passage for high school youth that should be embraced or avoided? P.S. Do you still remember mistakenly throwing away a whole tray of patties in the dumpster that were in fact intended for the refrigerator? I could never forget accidentally throwing food out- but it was a huge bag of French fries! I definitely think as a first job it makes you realize how important it is to get a degree.